A view from the roof of the Hingham Intermodel Center, a new transportation terminal located at the Hingham Shipyard. For the first time since ferries started carrying passengers between Hingham and Boston a little more than 40 years ago, South Shore commuters will have convenient facilities in a new terminal opening at the Hingham Shipyard, after years of planning, construction, and delays. And despite the opening date for the $7 million terminal getting pushed back month after month, ferry fans see the substantial building as a statement -- a recognition that the commuter boats are here to stay as an efficient and enjoyable way to move people around Boston Harbor. The Hingham Intermodel Center is an 8,400-square-foot, two-story modern building. The ferry service started in 1975 with a single daily trip and about 70 loyal commuters. 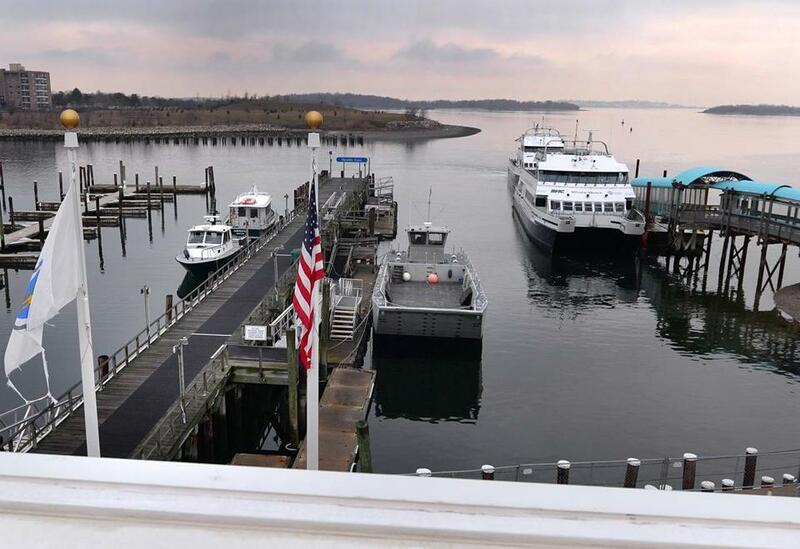 About 4,700 people now board the boats each day for the 35-minute ride between Hingham and Boston, and connections to Logan Airport, Hull, and the Boston Harbor islands, according to Boston Harbor Cruises. “Water transportation has proven to be very popular with commuters, and the MBTA is pleased to offer improvements that make the service even more desirable,” MBTA spokesman Joe Pesaturo said. 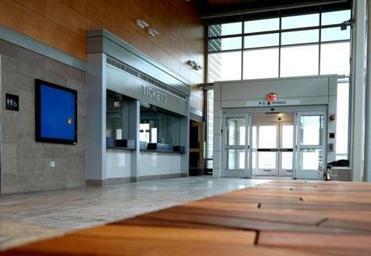 The lobby of the ferry terminal, with a wooden bench in the foreground. Weymouth Mayor Robert Hedlund, a longtime advocate for the boats while in the Legislature, also is happy to see those commuters finally get a “first-class” facility -- complete with a spacious waiting room and restrooms -- especially since “capital improvements have been very minimal” at the ferry terminal, he said. Hingham Town Administrator Ted Alexiades had more effusive praise for what’s officially known as the Hingham Intermodal Center. The difference is striking. 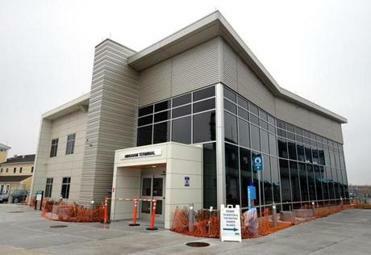 The old commuter boat terminal is tucked inside a vintage metal warehouse building owned by the state Department of Conservation and Recreation. There’s a ticket counter, some maps, and a few chairs. Think basic bus station in the middle of nowhere. The new two-story 8,400-square-foot building towers next door -- a modern edifice with clean lines designed by STV Inc., an architecture-engineering firm whose portfolio includes the new World Trade Center Transportation Hub in New York City. In Hingham, the waiting room in the new building is two stories high with walls of glass looking onto a stunning view of the water. There’s a sleek ticket counter, polished concrete floor, modern bathrooms, and benches made from reclaimed Atlantic City boardwalks. The new building is dedicated to Congressional Medal of Honor recipient Herbert L. Foss, who fought in the Spanish American War. 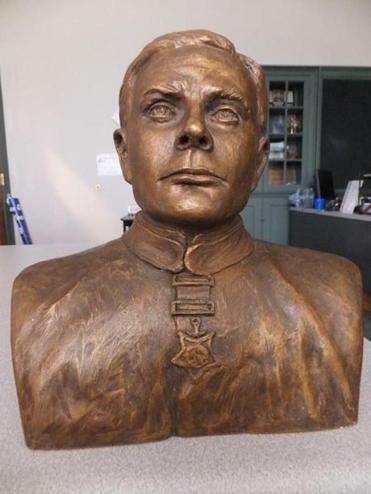 The building, which is owned by the MBTA on land leased for 99 years from the Department of Conservation and Recreation, is dedicated to Congressional Medal of Honor recipient Herbert L. Foss, a former Hingham resident recognized for his role in the Spanish American War. A statue of Foss dominates a corner of the concourse, and there’s a plaque detailing his heroism and an electronic link to a radio interview he gave in the 1920s. The rest of the building houses office space for DCR, the Hingham harbormaster, the Massachusetts Environmental Police, and Boston Harbor Cruises. The structure, funded through a combination of state and federal money, is loaded with “green” features. 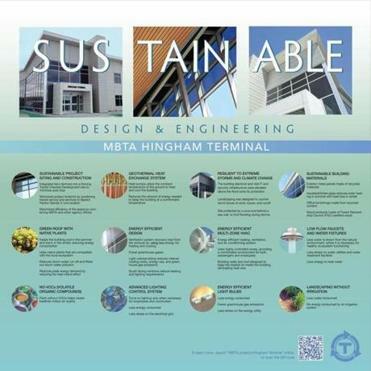 The intermodal terminal at the Hingham Shipyard has numerous "green" features, including a planted roof. Starting at the top, the “green” roof is covered in soil and planted with sedum to naturally cool the building in the summer and warm it in winter. Throughout the building, energy-efficient lights are electronically controlled so they only go on when necessary, and faucets and other fixtures are designed to use a minimum amount of water. There’s a geothermal heating system. And the tan metal panels covering the building are made from recycled materials, as are the office furnishings. The emphasis on eco-friendliness sometimes led to problems and delays during construction, according to Ellen DeNooyer, a senior project manager for the MBTA. The building originally was scheduled to open in mid-2015, at a cost of $6.2 million. The cost rose to about $7 million, with no final opening day set as of mid-January 2017. Compare that to the office building next door, which is approximately the same size and cost about $850,000 to build in 2008, according to town records, a figure that would be about $1 million if adjusted for construction inflation in the Boston area. The comparison bothers Hedlund, who said he’s baffled by the lengthy duration and high cost of the boat terminal construction. DeNooyer said the green aspects of the building are sophisticated and implementing them hasn’t been easy. “Even though it’s a small building, it’s a complicated building,” she said. One complication came from the glass in the building -- a highly energy-efficient type known as low-e glass, which has a metallic coating. 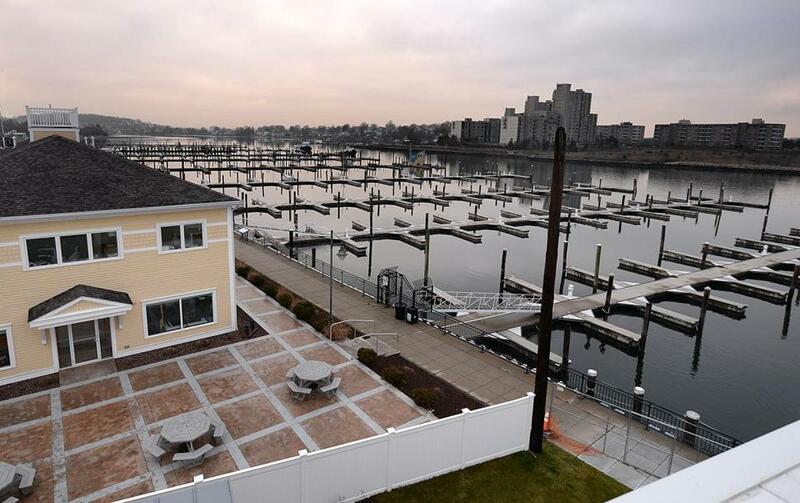 It turns out the coating interferes with radio signals used by the harbormaster and other first responders using the building, and required a technological fix, DeNooyer said. She said that early on the project slowed when builders discovered huge empty underground water tanks at the vacant site, left over from when the shipyard was used for building Navy destroyers during the Second World War. “We had some challenges,” she said. Next challenge: rebuilding the dock in Hingham to make it fully handicapped accessible and easier for the boats to maneuver. DeNooyer said that project is in the early permitting stage and will take several years to complete. Martha Bewick, a ferry advocate, said the docks were installed about 30 years ago and intended to be temporary. She applauded the planned upgrade, and the new terminal. 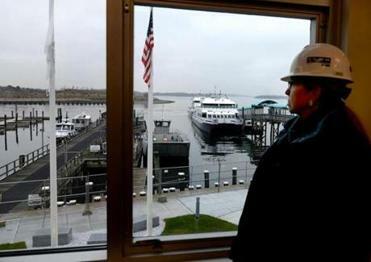 “It’s a wonderful addition to the ferry system in Boston Harbor, and long overdue,” she said. A view from the roof of the Hingham Intermodel Center.